We've to say goodbye to summer skin and cheeks now that September is upon us. Or do we? Just because the warmer days are gone doesn't mean we have to forget about having gorgeous skin and glowing cheeks. Gone are the autumns and winters where I used to pack on the foundation to give myself a somewhat decent looking visage. Now I'm embracing having a light base and adding a little extra somethin' somethin' with these new products that have found their way into my home and onto my face. On the left we have YSL's Radiance Blush No 9 from the Electric Chic collection and on the right is the Face & Blush Powder from Clarins' Graphic Expression collection. Each of these compacts are a thing of beauty. Both come in shiny gold packaging. The kind you need to "haww" on and clean it on your sleeve to get rid of any dirty fingerprints. Inside is where the magic is though. And yes, these are products that the old me would be afraid to mess up and use. But the new me knows that it's better to get stuck in and enjoy lovely products like these eh? 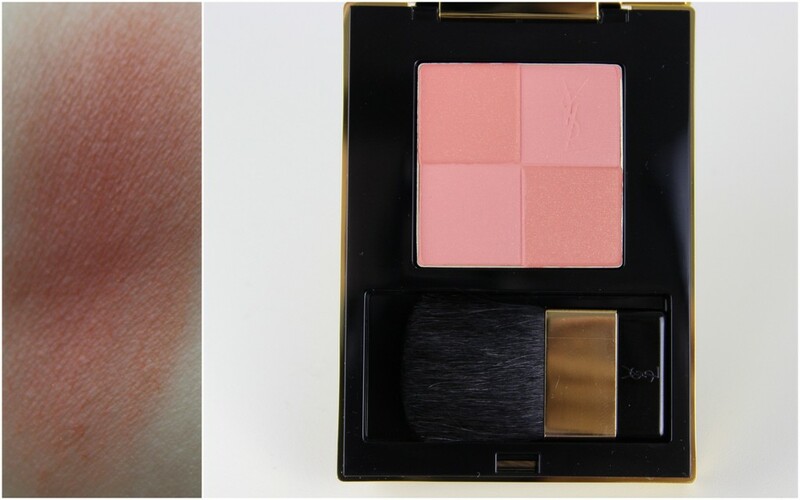 YSL's Blush Radiance No 9 is a stunning coral shade and you know me and my corals! It comes with a little brush that doesn't pick up much product, but is usable if you're stuck and need a topper upper when you're out and about. You can see that the blush has four little squares marked out; two of them are matte and two are shimmery. Swirled together, they give a wonderful hit of colour on the cheeks, the shimmer adding light and lifting your cheeks. The powder is finely milled and feels so light on the skin, staying put all day. The blush has great colour payoff, so be gentle and apply a little at a time, otherwise you'll look demented. Corals and I are just meant for each other. They suit my skin tone, my hair colour, my eyes and make me a happier person all round. So if you're looking for a new coral shade and want to treat yourself, then whip out your €40 and get to your YSL counter and you'll see just how beautiful No 9 is. 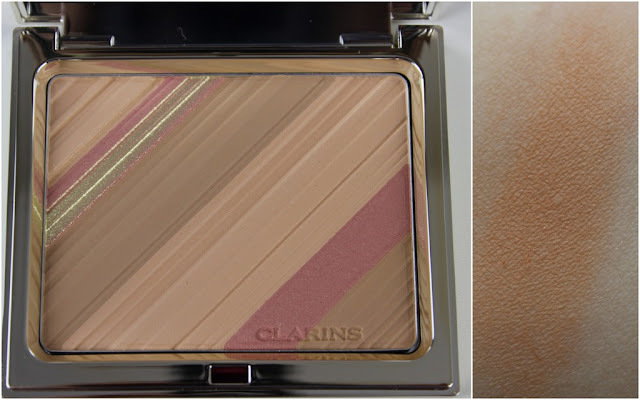 The Face and Blush powder from Clarins' Graphic Expression collection is a thing of beauty. And in terms of having to justify a purchase like this, let me make it easy for you. You can use it as a face powder, dusted lightly and evenly all over the skin. You can also use it as a contour or a blush, depending on which of the many shades you pick up. There are various peachy, bronzey hues in the compact with a tiny bit of gold overspray to add a smidge of shimmer. I've used this palette on my eyes too and it gives an easy neutral eye look in minutes. I swirled my finger around the palette into all of the shades for this heavy swatch below so you can see what you're playing with. When I use a big fluffy brush to apply it all over my face, it lifts my complexion while adding warmth and a subtle glow. This is limited edition and is €37, so be quick if this tickles your pickle. So these are what I've been rocking over the past couple of weeks to lift my complexion and add a bit of life back into my face. We're very happy together. What have you been rocking on your face lately? You like the look of these guys? Oh the YSL blush! *sigh* Gorgeous, just gorgeous! These look beautiful. Still i have just made a rather expensive purchase so maybe next month. Glad that there's so much love for these beauts! OMG!!! These two are so pretty. Love the color combos for they are light and seems natural on skin. I'll def check them out. Clarins palettes are always so pretty to look at, I am really tempted to get this one.